The Chart House offers a classic steak and seafood menu, plus some fusion choices in a very special setting. Located along historic Long Wharf, the abode of The Chart House was actually built in 1763, a colonial-era brick warehouse originally known as the Gardner Building. With a classic home-grown local menu, inside a rustic and well-maintained 200+ year-old setting, it doesn't get any more traditional than the dining experience at The Chart House. Situated in the heart of Boston's historic waterfront, The Chart House sets a high standard for local cuisine as experienced by people who aren't native to Boston. Long Wharf, constructed in 1710 and originally spanning around a third of a mile, has been transformed into a recreational and tourism center. 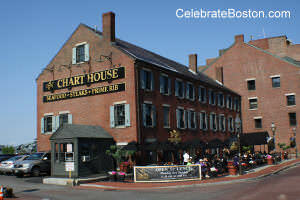 Near Chart House are other tourist attractions like the New England Aquarium, the Marriot Long Wharf Hotel, and other marine attractions such as Codzilla and the ferry to Charlestown. The restaurant also affords an excellent view of the Custom House tower from its summer patio, a fine example of local architecture. With the menu, you can expect the ever-so-popular Boston local choices of seafood, steaks, ribs and other traditional dishes. There are also a few Asian-fusion items to provide some variety and to build on the marine/seaside setting. According to reviews, most customers who dine here are very satisfied with the quality of the dishes. The steaks have a melt-in-your-mouth tender quality and the seafood is definitely fresh and well-seasoned. However, one common feedback given by customers is that some soups and dishes are a bit too salty. As for the desserts, the Lava Cake is a standout, but this needs to be ordered earlier than usual because it takes 30 minutes to prepare and serve. As for their service, well, The Chart House has been inconsistent in reviews with regards to how they treat customers. On one hand, you have birthday celebrants being printed their own special menu with their names on it, which they can take home, and on the other, one reads of people leaving after an hour of waiting to be seated even if they booked a reservation early. There are customers who have been really taken care of well with fast service, attention to detail and a great experience, while there were others who had the experience of being pushed to order expensive items, or even had to wait for an hour+ for their orders to be served. Overall, one thing the restaurant could work on is communication with the guests. Reservations have been reportedly booked when there were no tables left, and basically, expectations were set when they couldn't be reached. Another reason for high expectations in terms of service would definitely be the price range of the restaurant, which borders on the high end. Overall, The Chart House experience is worth trying out if one's budget permits it. Remember, you will not only be buying excellent food and (sometimes) exceptional service, you're also paying for the experience of eating in a very historic setting. Imagine eating in the second oldest operating building in the whole of Boston, beside the sea, with your choice of a vivacious patio (in summer), or a quieter indoor dining experience.